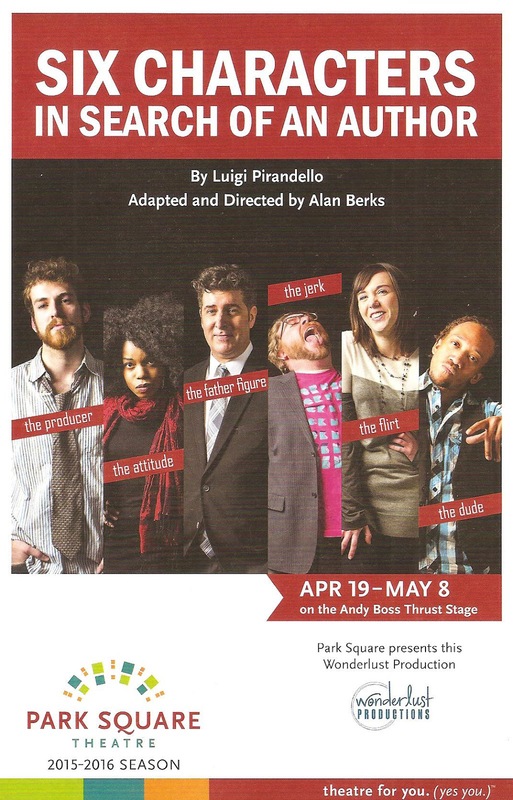 I first saw director and playwright Alan Berks' adaptation of the 1921 Italian play Six Characters in Search of an Author three years ago at Gremlin Theatre (one of the last shows in their space on University in St. Paul). I called it "a weird, trippy experience, one that's difficult to explain or make sense of. But it sure is fun to try." I was eager to take that trip again with a slightly revamped version of the show, featuring some of the original cast members and some new ones. It was fun to see it in a new space with some new additions, and with a little more preparation for what I was in for. It's still pretty weird and trippy, and still asks some intriguing questions about reality, fiction, and theater itself. 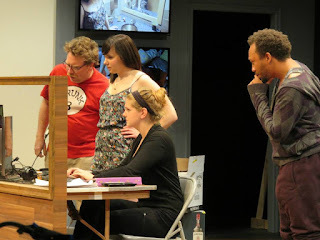 What follows is what I wrote three years ago, but with some updates about this production. I must confess, I'm a reality show junkie. But only the good ones - competition shows like Survivor, The Amazing Race, Project Runway, Top Chef, American Idol (farewell... for now), and Dancing with the Stars (is anyone else obsessed with deaf model turned dancer Nyle DiMarco?). I love these shows, but I'm very aware that they're a heightened and manipulated version of "reality." So when Wonderlust Productions' Six Characters in Search of an Author started out as a clever spoof of a reality show, I was in familiar territory. 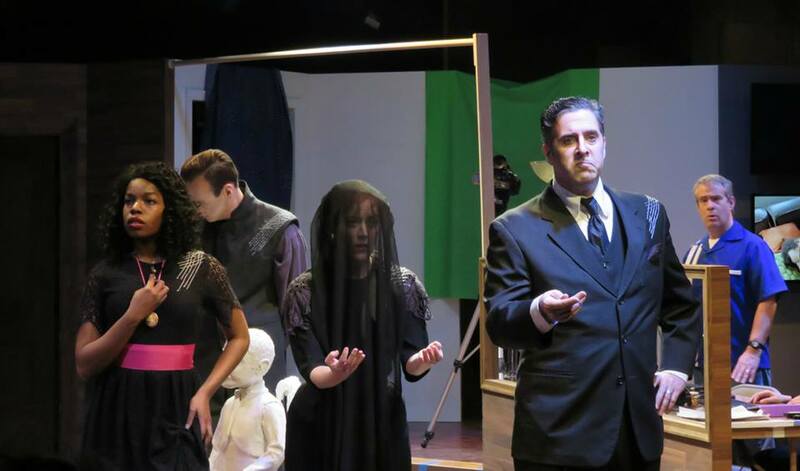 But soon the play took an unexpected turn into something much darker and deeper, a surreal exploration of reality vs. fiction and the creative process. Not what I was expecting, but a fascinating ride. Director Alan Berks and his talented company of actors have created a new adaptation of the 1921 Italian play of the same name, in which six people appear during the rehearsal of a play, saying they're characters from an unfinished story, searching for a new author. In this version, the play rehearsal has been replaced by a reality show called The Maze, in which contestants live in a mansion, searching for a key that will lead them to the hidden treasure (a show I might watch). Three contestants remain, with convenient reality show labels (and bearing the actors' real names) - the jerk Sam (Landman), the flirt Rachel (Finch), and the dude Michael (Terell Brown). These three actors were in the 2013 production, and they're so natural and funny that I'd like to watch an entire show just with them! The cameraman Joe (Weiner) from the 2013 production has become the host in this production (what would Survivor be without Jeff Probst?! ), and in a new twist, we the audience play the role of the live in studio audience watching the finale. Joe encourages us to take out our phones, take selfies (in the dark? ), and tweet. The interaction and playfulness of the actors is fun, but it's a little unclear if we're actually supposed to be tweeting, or turn off our phones like good theater audience members. Completing the reality show set-up is producer Paul (LaNave), an aspiring filmmaker who wants to tell stories, and two techs (Annika Wahlquist and Gregory Adam) who rarely speak but keep the cameras trained on the subjects. And this is where things take a turn. The six characters drop in from a story all their own, fully formed, aching to complete their story but forever stuck within it. There's a stern father (Adam Whisner, so good at inhabiting complex characters), a grieving mother (a devastating and devastated Sandra Struthers), a neglected son (an enigmatic Gabriel Murphy), a rebellious stepdaughter (a troubled and passionate Kiara Jackson), and two young children (creepily represented by white garden statues). To say they're a dysfunctional family is an understatement. They tell their story in pieces, each one interrupting and contradicting the others. Producer Paul begins to think there's a story here, and agrees to tell it on The Maze. He gets his contestants to act out the scenes, in the house and via confessional (that reality show staple). But the characters are not happy with this depiction, and insist on telling their story to its final and terrible conclusion. Six Characters is [still] a weird, trippy experience, one that's difficult to explain or make sense of. But it sure is fun to try. What is reality? What is fiction? And what lies in between? (Reality shows, and maybe theater too.) It's a really clever new adaptation of a classic play. The cast is so talented (the reality show cast so natural, the "characters" appropriately dramatic) that it's fun to watch them play; the only problem is it's impossible to watch all of them at the same time. Add in the innovative use of video, and you have a unique and entertaining evening at the theater. 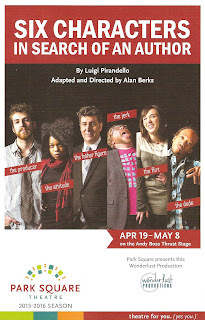 The Six Characters continue searching for an author at Park Square Theatre through May 8 (half-price tickets available on Goldstar.com).